Sometimes it seems like the investment community operates on the assumption that the world started in 1929 – or at least that the financial booms, busts and speculators preceding the 1920s are irrelevant to the modern investor. We think this is misguided. Just consider that this common worldview ignores an age where speculators lived in sprawling mansions on Fifth Avenue (as opposed to apartments in the same place measuring about 1/100th the size)! We imagine that there’s a lot to learn from looking at the past 300 years as opposed to the past 80. 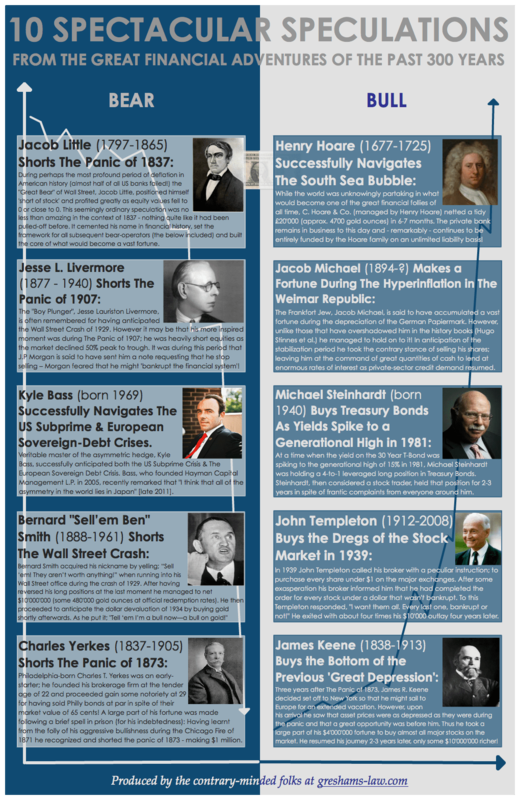 With this in mind; here we present what we believe to be the best trades of all time. Click image above for larger size.